Tools to help you grow your brand. Your Brand Identity is the Key To Your Businesses' Success. Branding is not a one-time event. It is an on-going process. It is good to review who you are, where you are going, and the materials (tools) you have to attract your target audience of today. Standing still and letting your brand grow cobwebs will undoubtably make your brand a thing of the past. Have you dreamed of a workbook that could help you get your company noticed or ignite the sparks to take your brand to the next level? 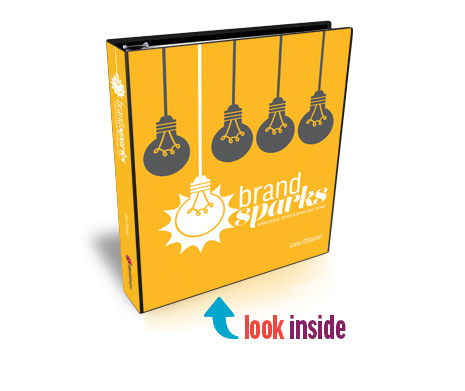 Brand Sparks is your must-have resource to help you build the roadmap for developing your company's market-leading brand identity and creating your eye-catching, unforgettable, ideal client-attracting brand. This in-depth branding and marketing 150+ page workbook will help you to define and position your brand, craft your messaging, build a unique brand platform and learn how to promote it. In this workbook you will learn how to how to define your brand, refine your brand messaging, position your brand to get the attention of your ideal customer and helpful tools to build a successful brand platform.